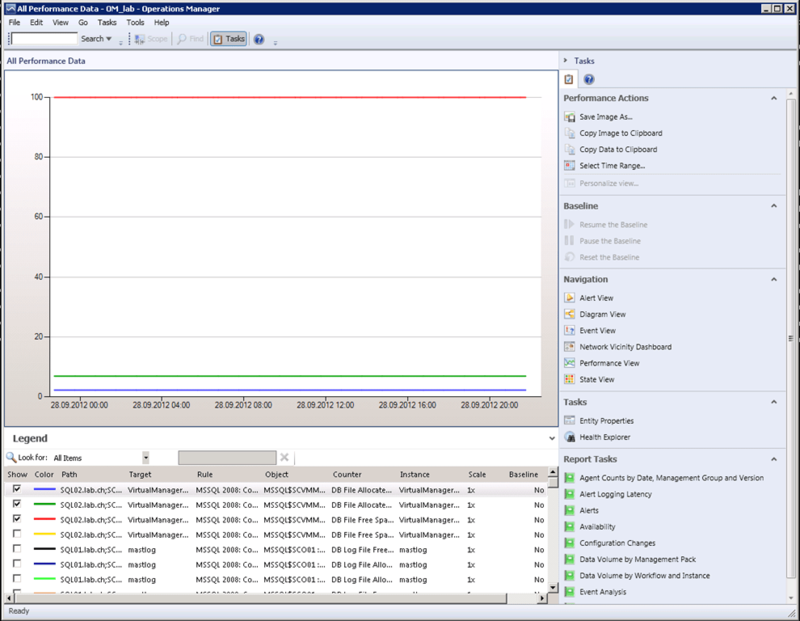 Did you know that the SCOM console has also parameters you can add? Well it is nothing new because they were also available in SCOM 2007 R2 but I think it is also worth a post to show how it works and how to get the necessary information. In SCOM 2012 the executable which is being used to launch the SCOM 2012 console rests in the “C:\Program Files\System Center 2012\Operations Manager\Console\Microsoft.EnterpriseManagement.Monitoring.Console.exe” path. If you call this executable in the command shell together with /? you will face this dialog. 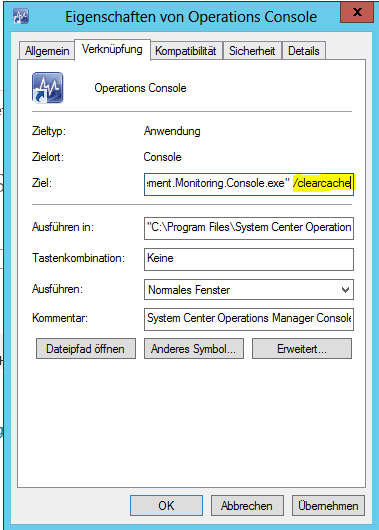 I think the most common option is /clearcache in the older SCOM version it was sometimes necessary to add this switch in order to clean the console cache if you had stale data. 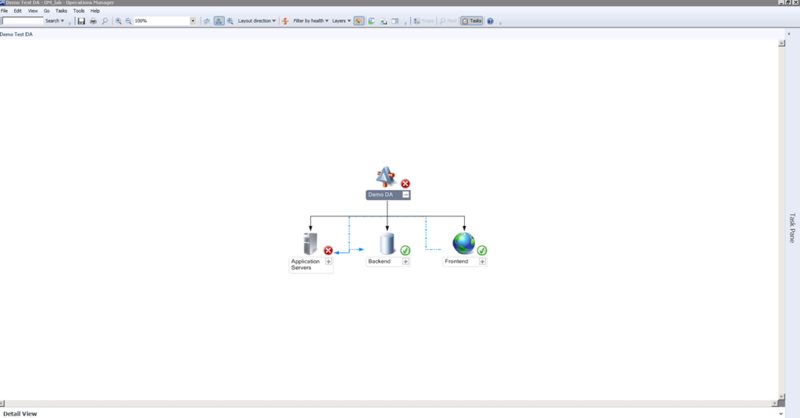 In SCOM 2012 you also can add this switch to your console link. I haven’t met any needs so far for using this in SCOM 2012 but good to know. There is a article on TechNet about when and how to use this switch. Of course you could also modify the OperationsManager shortcut for connecting always to a dedicated management server. This parameter is used to display just a view in a “full/only view scenario”. You might have a monitoring screen and therefore a dedicated computer. What you could do now is to make a batch which will after every reboot call a command to start a certain view. There are maybe more scenarios but I hope you get the idea . After entering this command the SCOM console will start and only your view will be presented. 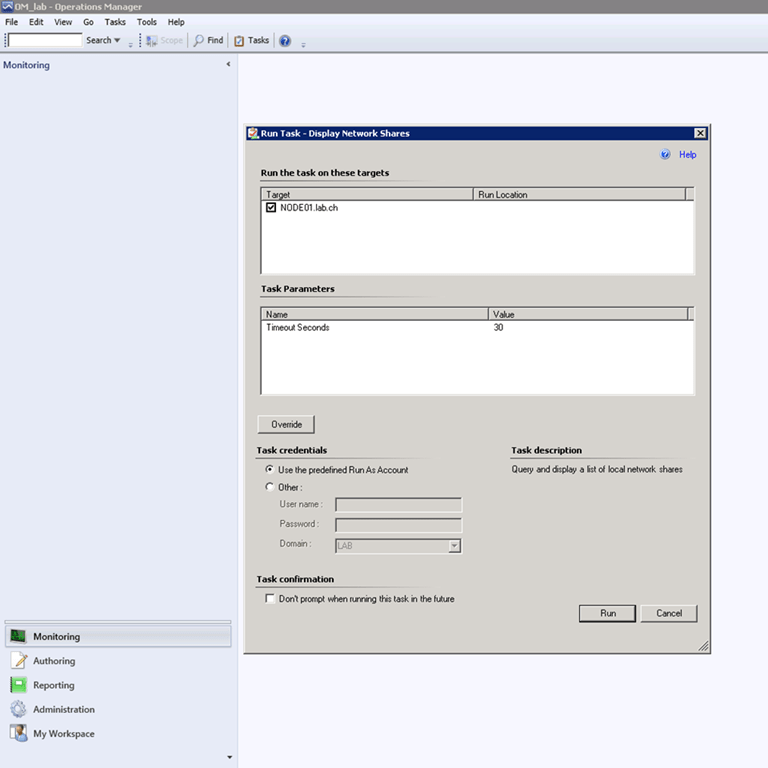 The management pack switch can only be used in conjunction with /Taskname or /Viewname. There might be a case when you need to provide a management pack for either one of these two parameters /Viewname or /Taskname. An interesting option is /Taskname: together with /TaskTarget: in this scenario you could launch a specific task against a specific target. In my case I want to launch a task which will show me the network shares on my Node01 computer. First I have to identify the task name. This is done by calling the following steps in Powershell. If you want to execute the commands you have to choices first you start it in regular command prompt (cmd.exe) as I normally do or if you want to execute it in Powershell you need to execute the command using Invoke-Expression. Let me know if you have any cool ideas where you are using these command line switches. 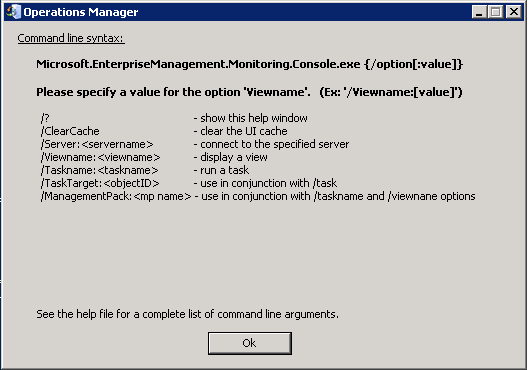 Hi Stephan, is theer any way to open SCOM 2012 console directly to Dashboard view? I am not Aware of other ways than mentioned in this post. I am missing my console task pane in SCOM console , Do you have any idea where do i check the settings?